Rachel Elizabeth, Surface Pattern and Wedding Stationery Designer. Rachel has registered copyright of 17 designs with Copyright House. Rachel Elizabeth Smalley has the ability to bring a touch of elegance and beauty to anyone's life. Not only that, but she can even make your wedding day extra special and totally unique. What's that you say? How can one woman achieve such incredible feats? Well, very easily if you have Rachel's artistic talents. Rachel is a surface pattern and wedding stationery designer. For those of you that are unfamiliar with the term 'surface pattern', it means that she designs patterns that can be used on surfaces (forgive me, I've never been one for detailed, comprehensive definitions! 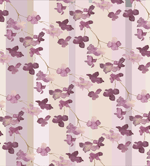 ), such as wallpaper, fabrics, wrapping paper etc. Rachel's exquisite taste and eye for detail means that, although her collections contain a great deal of diversity, each one of her extensive range of designs share one common factor: style! Although she has a natural artistic gift it was only after leaving school that Rachel started to realise her artistic ambitions. In 2006 she went to Leeds College to do a short course in art and design. Her enthusiasm, combined with her raw, talent meant that she left college 5 years later having achieved a National Diploma in Art and Design and a Bachelor of Arts honours degree in printed textiles and surface pattern design. These years of study helped Rachel develop her skills and gave her the confidence to start her own business. After only 2 years since leaving college she has had her wallpaper designs featured in Ideal Homes magazine, Bride Magazine have done a feature on Rachel and her wedding stationery designs, she has displayed her work at numerous Wedding Fairs, she has had her wallpaper designs advertised on leading wallpaper websites, she has built her own website and her business has been constantly growing. Not bad I suppose Rachel! One of the things that makes Rachel so successful, and that will ensure her future success, is her attention to detail: With all of her wedding stationery she uses only the highest quality materials; she will not settle for anything less than perfection; if you order some wallpaper from her she will even arrange for it to be fitted for you, should you so require; but perhaps the main thing that sets her apart from her competitors is her personal approach to her work. If you're the sort of person that wants something totally unique then she will create a design just for you. This is a service she provides on both her wallpapers and wedding stationery. When creating a bespoke design, Rachel works closely with her clients to ensure they get exactly what they want. She spends time to get to know them on a personal level so she can get a real insight into their character. She then uses that knowledge to create something unique and relevant to who they are. Now that's service!